I really wanted to like this. I’m into quirky wines – at least in principle. I quite liked the cute branding; and I liked the user-friendly bottle blurb: “smooth with rich blackberry flavours”. I like the theory behind the admittedly unusual pairing of three classic grapes. Shiraz and Mourvedre are often found together in Southern French (especially Rhone and Languedoc) blends – and indeed Australian imitations of and developments from said blends. Shiraz and Viognier are often found together in Australian blends, and French imitations of said blends. Given no blurb (or rather, having not read it) I was kind of expecting this South African red to be a fairly full-bodied wine, rich with spice and pepper, probably with some tannic tartness from the Morvedre, maybe with a twist of citrus or light perfume taking the weight off the blend – this courtesy of the Viognier. I’m probably flattering myself to presume I could detect each individual grape’s influence if I wasn’t looking for it; but I wasn’t expecting to find the ingredients of the wine so melded into what tasted to me like a homogenized whole – and not a terribly interesting one. Blackberries maybe. Smooth, I guess. But what more? What I smelled and tasted was a medium-bodied red with a touch – just a touch – of earthy elegance, but without many defined notes I could really grab hold of. The Shiraz felt too watered down to me, where it usually finds itself dominating either of the similar blends I mentioned (and in a good way). The Mourvedre seemed more of an idea than a presence, and so too did the Viognier; I felt that these latter two were battling for a secondary influence over the direction of the wine, and neither was winning. With the secondary grapes locked in a stalemate and the lead role being somewhat muted. It was only a fiver you know. (It’s on an introductory offer at Tesco.) So I really ought to have nothing to complain about; it was far better than most five pound wines, but I was expecting something really quite special from it, and I felt it all ended up a bit vague; a bit okay. 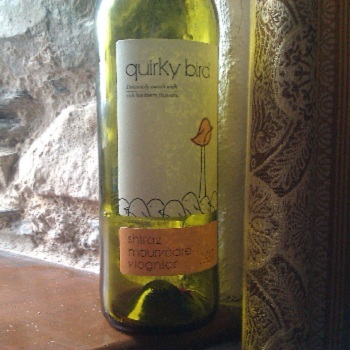 For an alternative – and more positive – review of this wine, check out the dubiously motivated Tesco wine community.